Each workout with 10 to 12 exercises can be completed in about half an hour. 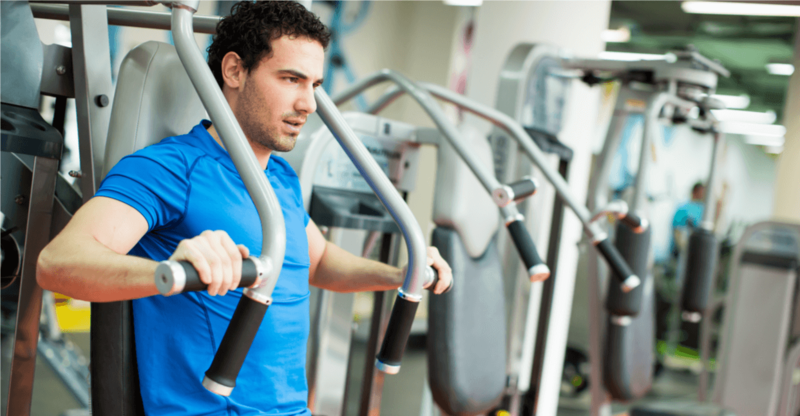 No warm-up needed as the exercises are performed with a moderate weight and extremely slow. Repeat the same workout 1 to 3 times per week. Alternate upper body and leg exercises for an extra effect on the cardiovascular system and optimal recovery. Rest 1 – 2 minutes between exercises. Slow movements and relatively high weights are one of the keys which make high intensity training very effective if your goal is strength, toning and long term health. Choose a weight which does not allow you to complete more than 10 extremely slow repetitions with correct form. Perform the 9 to 10 repetitions in 90 to 100 seconds. Example: 4 seconds up, 2 seconds hold, 4 seconds down. This slow movement allows you to focus on high muscle tension and correct form on each single repetition. As soon as you can do 10 repetitions in 100 seconds, it’s time to increase the weight on the next workout. Variety: Replace one exercise every 4 to 6 weeks.